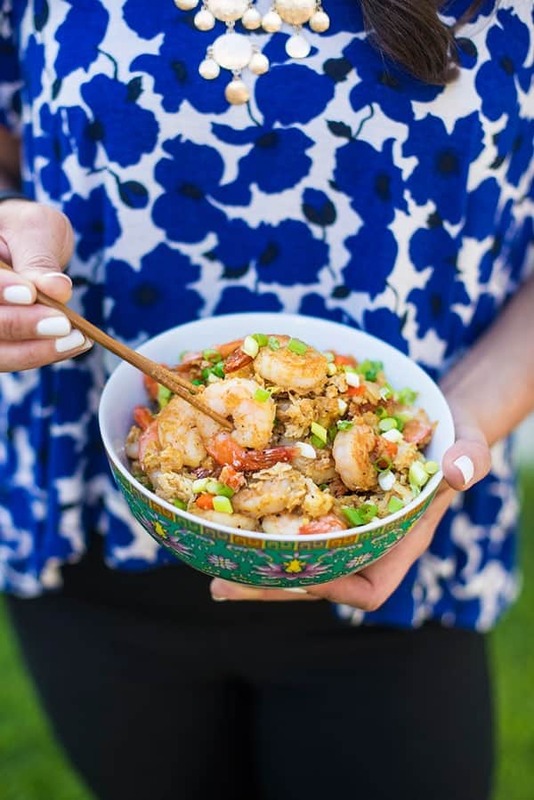 Skip the takeout and try this paleo-friendly cauliflower shrimp “fried rice” recipe! You won’t believe how easy and flavorful homemade Chinese food tastes. If there’s one dish I know my toddlers will always devour, it’s Chinese fried rice. 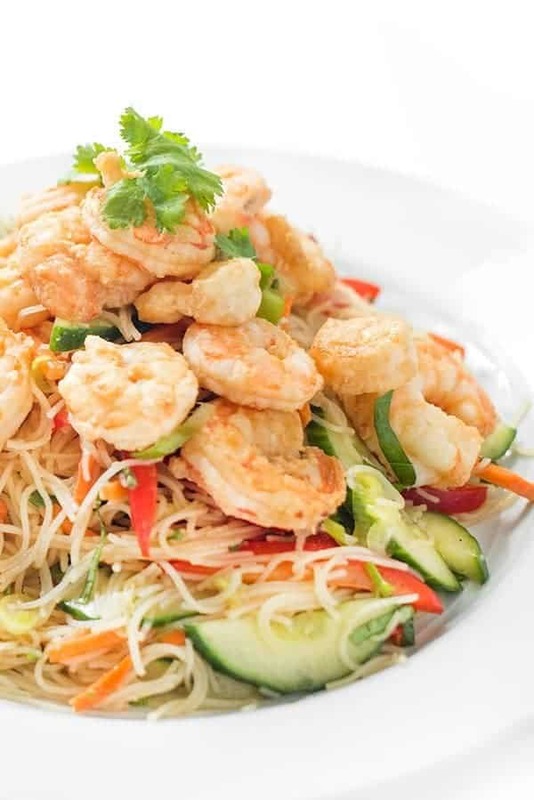 With my oldest on a major shrimp kick, I have been coming up with healthy versions of his favorite foods like Shrimp Pad Thai, Shrimp Wonton Soup and Shrimp Stir-Fry. Toddler palettes can be fickle so I’m riding this shrimp wave for as long as possible. 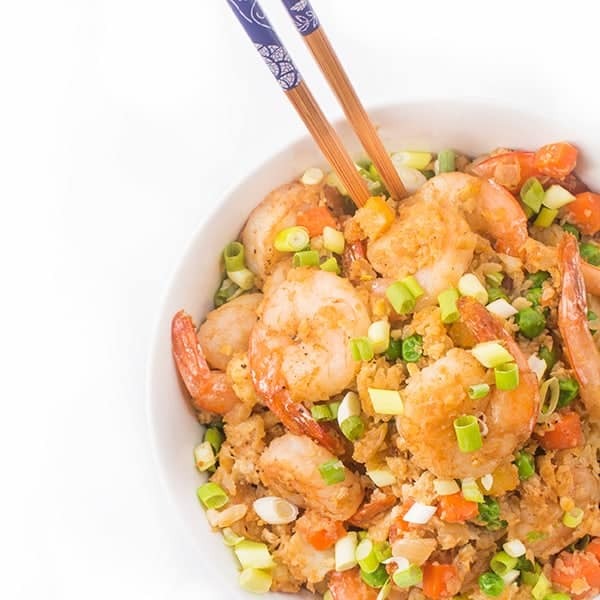 Our latest favorite is a paleo-friendly version of the classic Chinese shrimp fried rice. 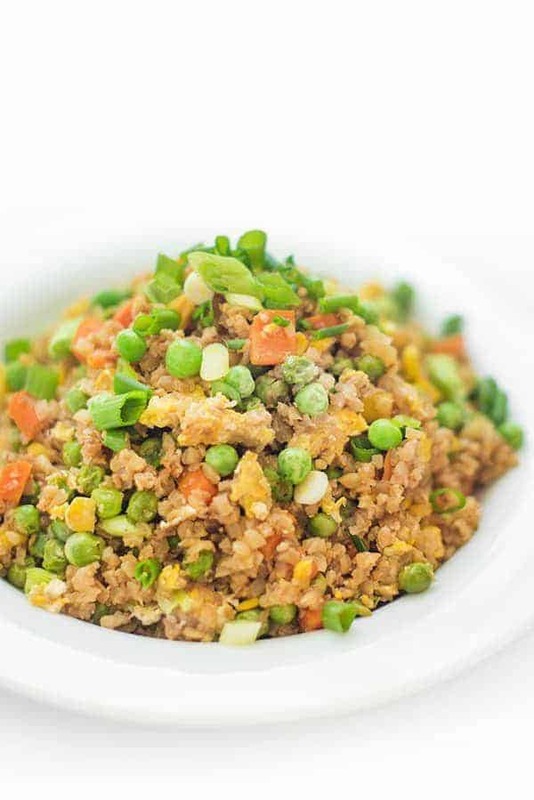 Instead of using traditional white or brown rice, we grate fresh cauliflower turning it into a grain-free rice. Beyond being packed with fiber and antioxidants, cauliflower has a number of health benefits and is a great way to get your entire family to eat more cruciferous veggies. Of course, cauliflower can be a little bland on it’s own so I like to use high-flavor, low calorie ingredients like fresh ginger, Nakano Natural Rice Vinegar, fresh scallions and toasted sesame oil to bring the dish together. Nakano’s rice vinegars come in a large variety of flavors (like mango or citrus), all free of artificial ingredients, flavors and preservatives. I used Nakano Natural Rice Vinegar because the clean acidity perfectly balances the bold ingredients throughout the dish. Packed with plump, juicy shrimp, bright vegetables and fresh herbs, I happen to think it tastes even better than the restaurant version. But I’ll let you be the judge. 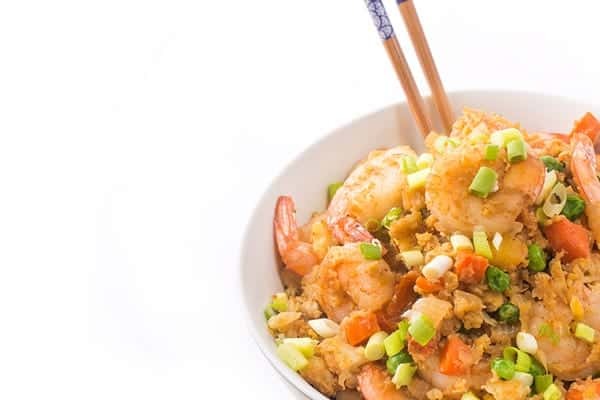 Skip the takeout and try this paleo-friendly cauliflower shrimp "fried rice" recipe! You won't believe how easy and flavorful homemade Chinese food can be. When veggies are cooked through, add cauliflower, soy sauce and rice vinegar to the pan. Stir well to combine then walk away for a few minutes so that the cauliflower can start to cook and create a nice crust. Come back, stir it around then walk away again. The flavor comes from letting the cauliflower brown a bit and become crispy. This process may take up to 10 minutes. It's worth the wait! Disclosure: I am honored to be an ambassador for Nakano. Thank you for supporting the brands that make The Lemon Bowl possible. All thoughts are my own. For more great Asian recipes, check out my Pinterest board! 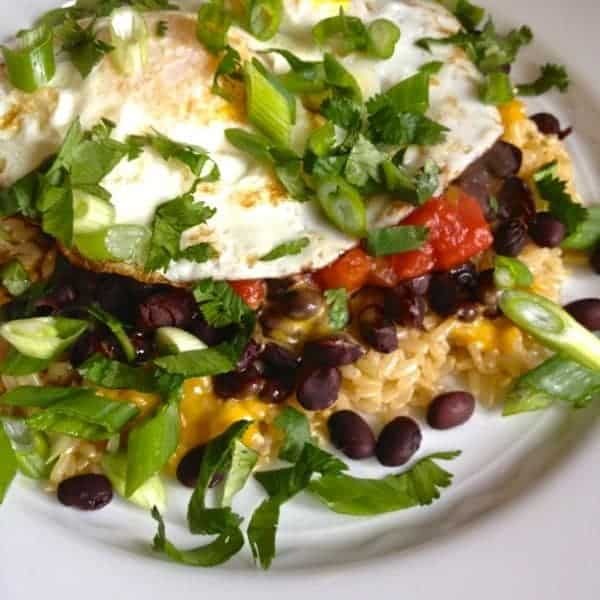 Fried rice is terrific stuff, and your recipe looks excellent. Is it possible to use a bag of frozen riced cauliflower instead? Made this dish tonight. I have been hearing so much about this dish. I’m always up for an healthy alternative that actually taste good. I also have to try and incorporate vegetables that my son would never , ever eat otherwise. This was that dish. Thank you so much for the recipe. I will definitely be putting thus one in the “keep box”. Oh I’m so happy! My boys love this (they are 3 and 5) and always ask for it. Let me know if you try any other recipes! I made this recipe using chicken breasts… it’s delicious, but I’m not sure at what point should the rice vinegar be added? So sorry about that!! It goes in when the soy sauce goes in! You have no idea how badly I want to make this!!!! It’s so damn good friend! This looks absolutely perfect! I bet I won’t miss the rice at all. You definitely would not miss the rice! Rice vinegar and sesame oil make everything taste better. LOVE! I think I have a new recipe to add to next week’s shopping list. I really hope you try this!! You’d love it!! 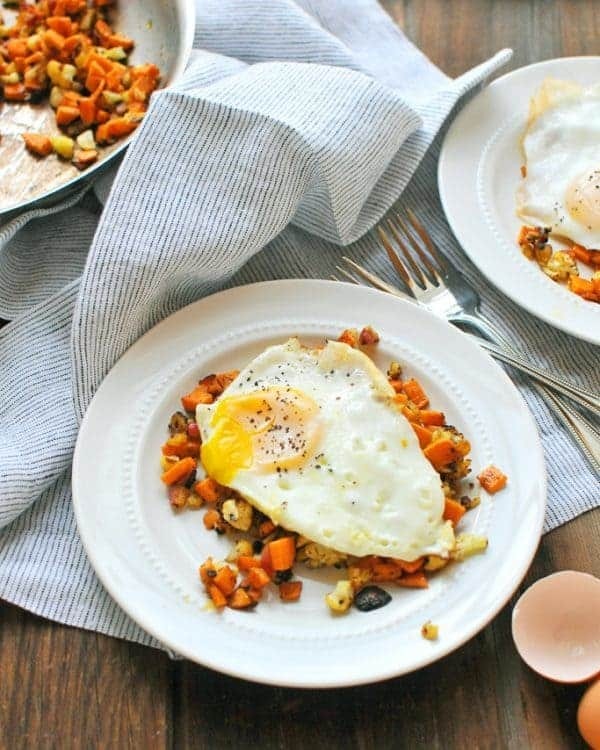 Love everything about this, can’t wait to make this for the fam soon! I hope you love it Matt! 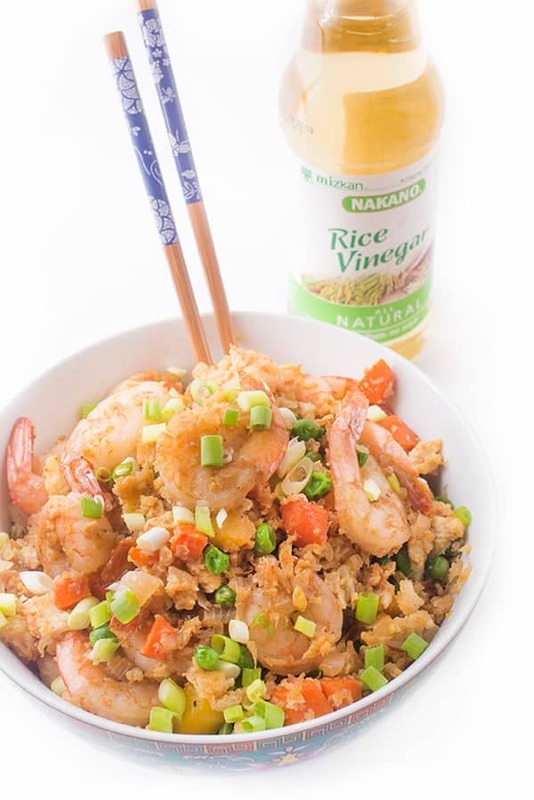 Rice vinegar makes so many things better! I always buy this brand. Love your sub of cauli for rice. I couldn’t agree with you more!! Thank you!